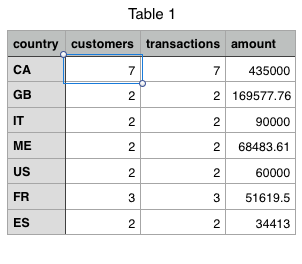 The countries report displays a breakdown of your sales by country. All amounts include tax (gross amounts). While Quaderno automatically notifies you when you reach a sales tax registration threshold for a country, checking your countries report will give you a quick overview of where you stand. You can also use this data for tax forms. By default, you’ll see the report for the current quarter. Select the period you’d like to see in the report.